In March this year (2018) Liam O’Flynn passed away. He was a giant in Irish traditional music: a master of the Uilleann pipes – probably the most difficult instrument in the world to play – but also, surely, the most beautiful. We were fortunate to secure tickets for the Memorial Concert to Liam, held in Dublin’s National Concert Hall last Sunday. I would give anything to re-live that experience, as often as possible. We were overwhelmed by the insights which were presented by musicians who had worked with him – and dumbstruck by the astonishing and inspiring performance which took up the second half of the concert: The Brendan Voyage, composed in 1980 by Shaun Davey for the pipes and full orchestra, and written for – and with the collaboration of – Liam O’Flynn. In all, a most fitting tribute to a Maestro – pictured above in 2015 with the RTE Symphony Orchestra (courtesy RTE). For anyone unfamiliar with this piece of music, here is the second movement – The Brendan Theme – from the recording published by Tara Music Company in the 1980s, with Liam O’Flynn as soloist. It’s a good introduction to the (then) novel concept of combining the sounds of pipes and orchestra: the full suite (42 minutes) is available to stream, download, or as a CD. It’s a work with memorable tunes and expansive orchestration: it could only have been written in the twentieth century, yet it is thoroughly approachable and is sure to bring any audience to its feet at the end. As a former tuned percussionist, I envied the rousing finales given to the timpani and cymbal section! You can’t beat the atmosphere of a sold-out live performance in a full-sized concert hall such as this one in Dublin. We were fortunate in being seated only a couple of metres back from – and with a full view of – the soloist who, for this occasion, was Mark Redmond, a young piper from Gorey who has already established his reputation as a top-class musician. 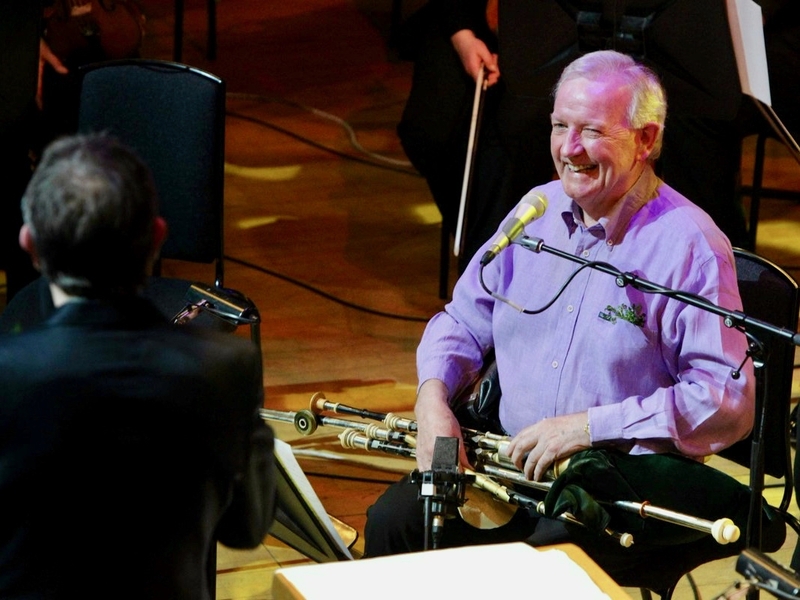 It would be hard for anyone to have to follow in the footsteps of Liam O’Flynn, but the rapturous ovations given to Mark – and the fabulous RTE National Symphony Orchestra conducted with such panache by David Brophy – proved that the ancient tradition of Uilleann piping is being ably advanced by our upcoming generations. 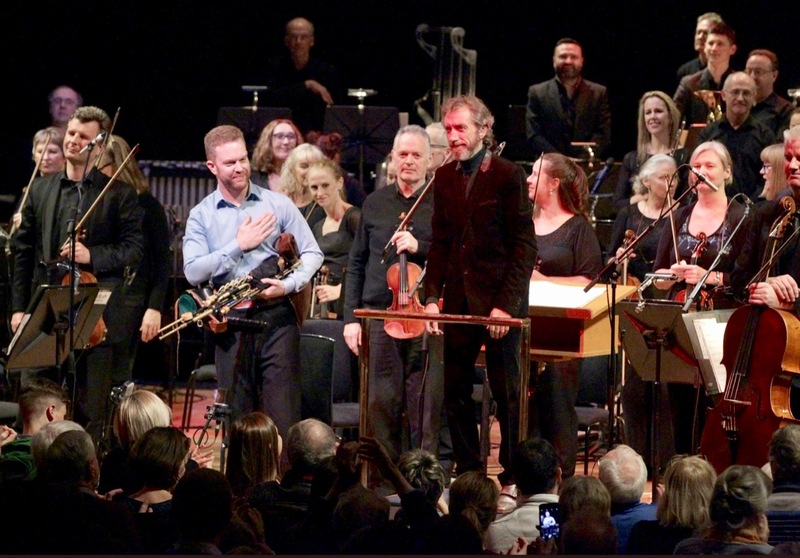 (Photo above of Mark, David and the Orchestra taking a bow last Sunday courtesy Mark Redmond via Twitter). The piece of music is ‘a story within a story’ – it is inspired by Saint Brendan, born in Fenit, Kerry in AD 484 who, with a group of monks set off in the sixth century in search of The Blessed Isles (Paradise). 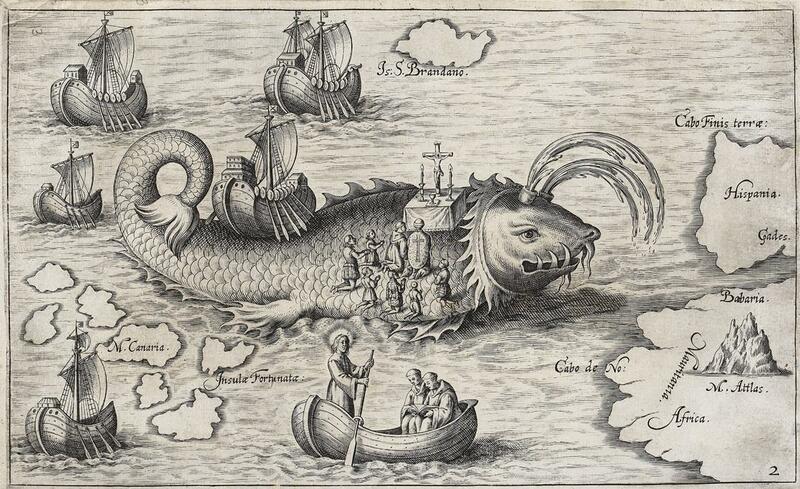 Stories of their many adventures have been recorded and illustrated down the centuries – including the one above which shows the monks landing on an ‘island’ to celebrate mass: the island is actually a giant sea-monster named Jascon! 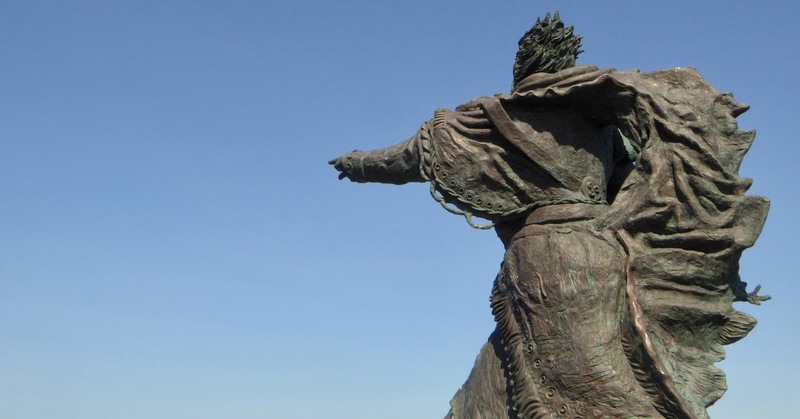 Brendan and his companions crossed the Atlantic, arriving in what we today call Newfoundland – long before the exploits of Columbus. What’s more, they returned safely seven years later to tell the tale. Brendan The Navigator is buried outside the Cathedral of Clonfert, Co Galway, as we have noted in one of our previous posts. And here’s another post about him. 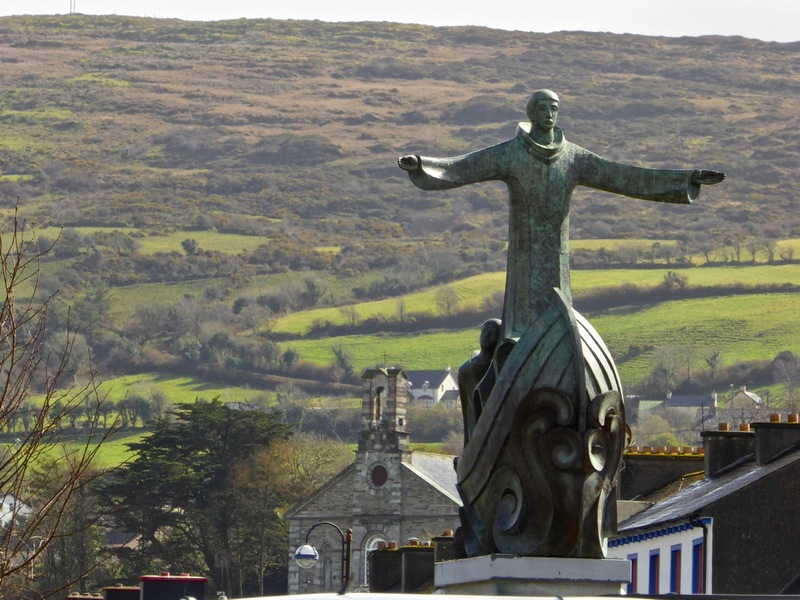 But we must not forget that Brendan has West Cork connections too: an elegant modern statue of him is situated in Bantry, looking out over the Bay. In 1972, Liam O’Flynn joined with Christy Moore, Dónal Lunny and Andy Irvine to found a seminal Irish traditional group – Planxty. Incarnations of that group – with additional players – have travelled the well-worn roads over the years, and on Sunday the remaining three original members, together with Matt Molloy, played for us – and brought on waves of nostalgia. 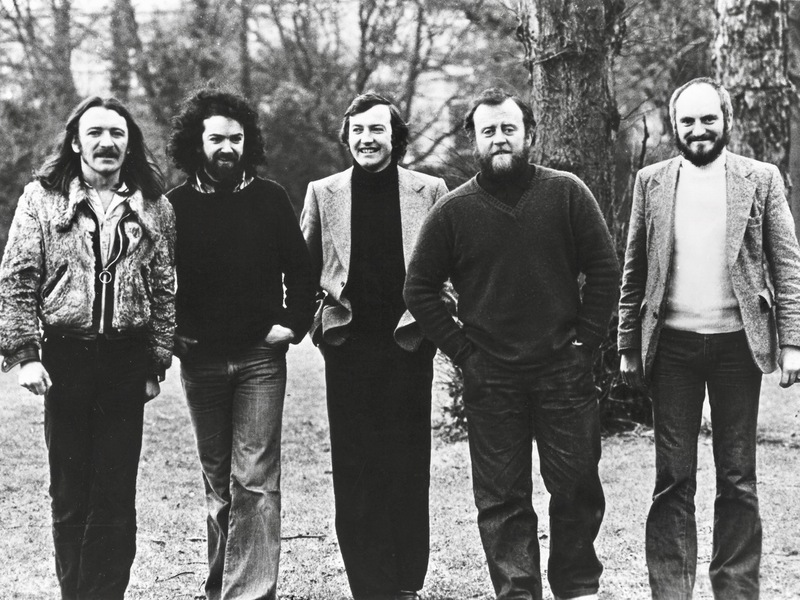 The photo from the 70s, below (courtesy of Tara Music), shows them together: Liam O’Flynn is in the centre. Underneath is some footage from Planxty in their prime. We were treated to other reminders of Liam’s achievements, including a performance of music he was commissioned to write for the inauguration of the Republic of Ireland’s 8th President, Mary McAleese on 11 November 1997. Here’s An Droichead (The Bridge) with Liam and guitarist Mark Knopfler: McAleese stated that the theme of her Presidency was ‘Building Bridges’. It’s impossible to put into words the level of exhilaration we felt throughout the memorial concert last weekend. I hope that, at the very least, I may today have sparked some interest in the music of the Maestro, Liam O’Flynn (for those not already in the know) – and in the thrill of Shaun Davey’s mighty concert piece The Brendan Voyage. Here’s a last extract from that work, with Liam playing. It’s the climactic movement ‘Labrador’ – the pipes bring in a variation of the main theme to celebrate the boat’s arrival in the New World and the end of the voyage. Lastly, Saint Brendan the Navigator is celebrated in his birthplace of Fenit, Co Kerry where he looks out eternally over the ocean which he and his companions conquered in their small, hide covered curragh.